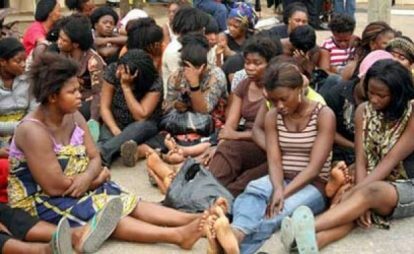 The National Agency for the Prohibition of Traffic in Persons (NAPTIP) on Wednesday said it had received 68 victims of human trafficking deported from three countries in March. The NAPTIP Acting Director General, Mr Abdulrazak Dangiri disclosed in Abuja that 37 were deported from Mali, 25 from Burkina Faso and six from Ghana. According to him, the victims were arrested by police in the three countries, handed over to Nigerian embassies and subsequently transported back home. He disclosed that among those arrested in Mali were four suspected human traffickers. “The four suspected traffickers from Mali are still under investigation to ascertain their level of involvement before charging them to court” he said. The acting DG said that the rescued victims would be counselled and rehabilitated by NAPTIP before handing them over to their relations. Reacting to the recent deportation of Nigerians from Italy, Dangiri said that most of the deportees had committed drug related offences and some were illegal migrants. He said that all victims in the agency’s custody were well taken care of in terms of their health and welfare, adding that some of them were even sponsored to return to school. The acting DG appealed to state governments and corporate bodies to collaborate with the agency in tackling the menace of human trafficking in the country.